Threats from armed conflict, including terrorism. Islamic State (IS) militants beheaded an antiquities scholar in the ancient Syrian city of Palmyra and hung his body on a column in a main square of the historic site, Syria’s antiquities chief said on Tuesday. IS, whose insurgents control swathes of Syria and Iraq, captured Palmyra in central Syria from government forces in May, but are not known to have damaged its monumental Roman-era ruins despite their reputation for destroying artifacts they view as idolatrous under their puritanical interpretation of Islam. Syrian state antiquities chief Maamoun Abdulkarim said the family of Khaled Asaad had informed him that the 82-year-old scholar who worked for over 50 years as head of antiquities in Palmyra was executed by Islamic State on Tuesday. Asaad had been held for more than a month before being murdered. Chris Doyle, director of the Council for Arab-British Understanding, said he had learned from a Syrian source that the archaeologist had been interrogated by Isis about the location of treasures from Palmyra and had been executed when he refused to cooperate. Amr al-Azm, a former Syrian antiquities official who ran the country’s science and conservation labs and knew Asaad personally, said the “irreplaceable” scholar was involved in early excavations of Palmyra and the restoration of parts of the city. “He was a fixture, you can’t write about Palmyra’s history or anything to do with Palmyrian work without mentioning Khaled Asaad,” he said. “It’s like you can’t talk about Egyptology without talking about Howard Carter. “He had a huge repository of knowledge on the site, and that’s going to be missed. He knew every nook and cranny. That kind of knowledge is irreplaceable, you can’t just buy a book and read it and then have that. Artifacts looting remains a major problem where ISIS is concerned, both for the destruction it causes to Syrian and Iraq cultural heritage and because the revenue the group earns then goes to fund its continued militant activities. On June 1, the US House of Representatives passed legislation to empower the State Department to track and prevent illicit trade in looted Syrian artifacts, but at present the bill is in committee in the Senate. The lost or damaged artifacts range from early-20th-century minarets to millenniums-old treasures. For many experts, the biggest catastrophe is in Aleppo, an ancient trading terminus and Syria’s largest city. Fire gutted most of the central souk, a vast and vibrant labyrinth of 17th-century shops, storehouses and ornate courtyards. It was the city’s commercial heart, important for understanding how people have lived since medieval times. Fighting between Syrian government and anti-government forces damaged the Great Mosque in Aleppo, one of Syria’s oldest, burning its library containing thousands of rare religious manuscripts. Its famous minaret, which had stood for a thousand years, was toppled. Aleppo’s iconic citadel, one of the world’s oldest castles and an excavation site, built on a massive outcropping of rock, was also a target. It has been used by government forces as a base and was hit by rockets. Western experts are uncertain what has happened to a recently uncovered Bronze Age Neo-Hittite temple there. The Islamic State and other extremists are motivated by the idea of punishing “shirk,” or idolatry. As a result, they have smashed Shia and Sufi sites, statues of poets, Mesopotamian relics from Assyria and Babylonia, and Sunni shrines that are outside the bounds of their narrow beliefs. The destruction is also useful propaganda, proving their power, advertising their ideology and attracting international attention. Scholars and those who work in heritage preservation are divided on the question of whether or not to reveal sites that may be in grave danger, whether it’s worth alerting people to what needs to be protected given that doing so could also make those sites a target for ISIS. There’s also the open question of how far the governments fighting ISIS would be willing to go to protect sites; would the US pass up an airstrike over the risk of hitting some irreplaceable historical monument? Would it, or its partners, commit assets specifically to protect such a site from ISIS? It’s not clear how those scenarios would play out. We’ve talked about the risk that Salafi groups pose for heritage sites and historical materials. This story, via Agence France-Presse, shows that, as we saw recently in Mali, local populations are taking a stand againt this kind of wanton destruction. Presumably looting could make a list like this one any year, but the turmoil in places like Egypt and Syria (keep reading) made this an especially difficult year for curtailing the illegal trade in antiquities. Apart from those two places, which we will deal with separately, looting was also rampant in places like Macedonia, Libya, Gaza, and Somalia. Billions of dollars are being made illegally each year via the antiquities trade. Even in the United States, the issue of art looted by the Nazis and brought to American museums after the war is still relevant. It was a year of incredible change and turmoil in Egypt, with the elected but increasingly undemocratic government of Mohamed Morsi and the Muslim Brotherhood being forced from power by the Egyptian armed forces in July. Dueling protests, both for and against Morsi and then, after the coup, for and against the new military government caused chaos in the streets of major cities like Cairo and Alexandria, and threatened Egypt’s priceless stores of antiquities. In August the Malawi Museum in the Upper Egyptian city of Minya was ransacked and looted. The museum has recovered some of its collection, but the search for the rest of its pieces is ongoing. Despite the chaos, and the promise of further chaos if Egypt is unable to transition from its current repressive military government to a stable democratic system, the removal of the Muslim Brotherhood from power was probably a good thing for Egypt’s antiquities. The Brotherhood is another offshoot of the same kind of ultra-conservative Islam that produces those Salafi groups that have damaged or destroyed precious historical sites throughout the Islamic World, and Morsi’s government showed little interest in protecting Egypt’s cultural heritage from looters and developers, prompting UNESCO to threaten to remove several Egyptian sites from its World Heritage list. Perhaps the biggest loss, and risk of further loss, has been in regards to Egypt’s Coptic churches, which have been targeted by angry pro-Brotherhood protesters on religious grounds. All over the world we saw sites threatened and destroyed by unchecked commercial and industrial development. A 2300-year old Mayan pyramid in Belize was obliterated to make gravel. A 4000 year old pyramid at El Paraiso, Peru, was destroyed by developers. The threat of unchecked mineral mining has put ancient sites across Afghanistan at grave risk. Ancient burial mounds, some more than 4000 years old, are being destroyed by development in Bahrain. Prehistoric sites are being demolished by developers in the Bujang Valley in Malaysia. Developers plowed up a 2000 year old necropolis in Cyrene, Libya. Sites from the earliest days of Islam continue to be destroyed in Saudi Arabia. America is not immune to this trend, as American Indian sites are being wiped out for things as frivolous as new Walmart warehouses. In October, 7.2-magnitude earthquake devastated heritage sites in the Philippine province of Bohol, in particular reducing several centuries-old churches to rubble. Two of these churches, the 17th century Loboc Church and the 18th century Baclayon Church, had been considered for UNESCO World Heritage status before they were destroyed. The devastation caused by Super Typhoon Haiyan, only a month later, compounded the challenge of recovering these sites and also damaged several other heritage churches all over the country. The preservation of Syria’s cultural heritage is critical to its reconstruction, reconciliation, and re-building of civil society, Richard argued at the Met event. Historical sites and objects “are a part of Syrian life — a source of pride and self-definition for their present and future,” she said. Losing its cultural history would rob Syria of the economic opportunities linked to tourism and cultural preservation; in 2010, tourism accounted for 12 percent of the country’s GDP and employed 11 percent of its workers. News came today (via) that the oldest surviving part of the Great Mosque of Aleppo, a minaret that was built in 1090 and survived a fire that destroyed parts of the mosque in 1159 and survived even the Mongols in 1260, was destroyed in fighting between the Syrian rebels and government forces. The government is claiming that the rebels blew it up, for what purpose is anybody’s guess, and the rebels are claiming that a shell from a government tank did the deed. Either way, a precious bit of Syrian heritage is gone forever, and I would argue that, whatever your feelings about the Syrian rebellion, there is no justification for something like this. It goes without saying that the massive loss of life in this conflict is sickening and astonishing, but the wanton destruction of centuries-old, irreplaceable pieces of cultural heritage is also sickening. Why are Sufi shrines being targeted? We are seeing a great deal of violence being done to cultural heritage sites across the Islamic World by relatively small orthodox Islamic groups, most particularly in North and West Africa, for example in Mali, in Libya, and in Egypt. There has been some outcry from the international community and a bit of coverage in the Western media, but I’m not sure that enough attention has been given to why these attacks are happening. To us, this kind of thing makes no sense. Imagine some kind of hardline fundamentalist movement taking a bulldozer to the Lincoln Memorial or to a venerable old basilica in Europe. It’s hard to get that image in your head, isn’t it? What could any group hope to gain from an act like that? In my view, it’s important to understand the motives behind groups that want to rob us of our heritage, because the way to stop them lies in defeating their arguments and rendering them unable to win support from the public and/or government of the country in which they act. 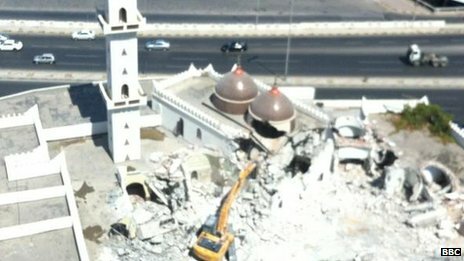 In this case, what we have are radical militant Islamic groups, such as Ansar Dine and al-Qaeda in the Islamic Maghrib, that seek to demolish sites of popular religious devotion in the service of their rigidly regressive understanding of Islam. Basically, it has to do with the long tension between two different Islamic communities: Sufis and Salafis.